*Note: Not compatible with 64 bit or Windows 7 computers! We're pleased to offer the White Embroidery Machine with exciting features. White offers a dedicated embroidery machine that creates beautiful embroidered designs at a price that is truly affordable! 100 delightful built-in designs plus 10 alphabet fonts are just the beginning in a long list of features. Use White design cards to add to your design library or download designs and digitize them for added creativity. It comes with White embroidery card slot, USB port, PC cable and digitizing software downloadable in .dst format. Navigator software CD serial number must be registered online before it will work with your computer and the machine. Not for 64 bit computers, without new drivers being installed by your computer supplier. Move forward and backward through the stitching. 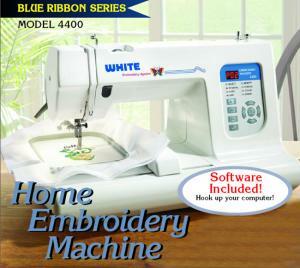 The White 4400 embroidery machine will give you the power to create embroidery right in your own home. Comes with 100 designs via a USB cable that you can access the world of designs available on the internet. Requires a PENTIUM III processor, 128MB of RAM, CD-ROM drive, 45MB minimum hard disk space, USB port, Microsoft compatible mouse, color standard VGA adapter. *Not compatible with 64 bit or Windows 7 computers! Otherwise, Click HERE to try installing new drivers or get from your computer supplier, with no guarantee from AllBrands or White that the driver installation will work with your computer. These exceptional features = More embroidery options!! Machine has first 100 designs already loaded in machine memory. 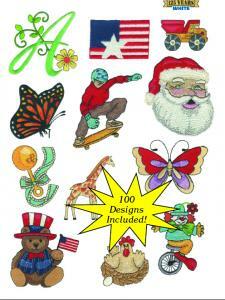 Auto digitizer creates designs using clipart or original artwork. Transfer color blocks to the machine all at one time. Tools include: text, center, flip design, zoom, fit to window, 3D view. Navigator software selects design, deletes or sends designs to internal memory and views designs from design cards. New drivers are required for running on Windows 7. Create original designs from any popular artwork format or your scanned image. The list of accessories also is pictured on page 34 of the manual. 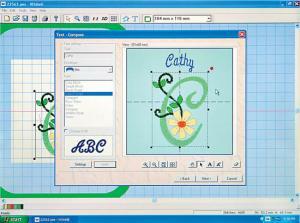 You will love creating personalized embroidery designs with White 4400! It’s fun and easy! *The Marie Osmond Emotions EM1 machine is the same basic machine as the White 4400, except that the Emotions machine's card slot does not support any currently available embroidery cards on the market such as White has, and does not have an open source USB port in the most popular commercial .dst format like the White 4400, severly limiting your design import and software choices to proprietory OESD/Bernina-only subscriptions for 200 more designs. The Emotions EM1 only have 40 designs built in the machine whereas White 4400 starts with 100 built-in designs. The White 4400 works with Great Notions and Amazing Designs products such as Amazing Box, Smart Sizer, Lettering Pro, Magnificent Monograms, Fast Fills, etc. because it is in .dst format. The Emotions EM1 only works in a proprietory and exclusive version of Bernina .art format for downloads to the machine, whose designs are only available from OESD and only for the Emotions EM1. That is not open source. What do the White 4400 on screen error messages mean? Why do my needles break? Hopefully the needles did not break or burr the plastic bobbin case or rotary hook/point underneath. If the needles broke hitting the plate or foot, they all can be polished off with Crocus emory cloth from the hardware store before use. The reason needles can break is if the top thread gets caught anywhere in the top thread path and jerks the needle into the foot, plate, hook or bobbin case. As long as the top thread stays in tension, has smooth consistent delivery, and doesn't get caught on the spool, spool pin, spool cap, thread guides, tension discs, needle bar, etc., it will not pull on the needle to break it. You can test by threading top thread through the take up lever while presser foot lever is up, then let presser foot lever down and pull manually on the thread to see that the thread is down between tension discs and has strong pull on tension at #4 or #5, and is not getting caught anywhere. If you are using cone threads on the horizontal spool pin, switch to a vertical thread stand to the right of the machine. Organ needles are also shorter than Schmetz needles(that can drag the bottom of the rotary hook to break needles). You can also check timing by removing needle plate and bobbin case to see of the rotary hook point is coming around the back of the needle ABOVE THE EYE to catch the bobbin thread. Please advise what you find. Why does my thread break? Diane, have any of your needles either hit something underneath or broken off while sewing? If there are any needle burrs on the plastic bobbin case rim, rotary hook, needle plate or foot, they have to be polished off with Crocus emory cloth from the hardware store before thread will stop catching on the burrs, shreading or breaking. The other thing that can cause thread breakage is needles if they are burred, bent or eye size too small for the thread you are using (go up a size to test). Is the top thread coming out of tension discs or getting caught on thespool, spool pin, spool cap, thread guides, etc. If you are using cone thread on the horizontal spool pin, switch to a vertical thread stand to the right of the machine that will not catch the thread. Also start with polyester thread with more tensile strength than rayon. Finally, check the needle clearance between needle and rotary hook by removing needle plate and bobbin case for manual inspection (they should not touch). Please advise. I have owned the White 4400 embroidery machine for 7 years. It is a great little machine. The ones selling now, are they exactly the same or have they been improved any? Can you tell me if White will be coming out anytime soon with another machine like this one with larger hoops and a cap hoop attachment? Can you tell me who actually makes the White machine? Thank you for your help. Thank you so much for your help. I checked out the Brother PE770 but I like the fact that I can view everything on the computer screen with the White 4400. I do some stops and skip parts of designs and start again and was told I could not do that with the PE770. The White 4400 has so many neat features that I am used to and was looking for a machine just like it except with bigger hoops. Now that I see I can get bigger hoops I will stick with it. I bought a Singer Futura XL400 and after having it a week and not being able to make it work, it went back. In the mean time I sold my White and now I am getting ready to buy another one. Unless you can reccomend another one. Liz, we do not have any such embroidery only machine with larger than 4x4" hoops, digitizing software and USB cable except for the White 4400. This machine is discontinued and the drivers have not been updated so it cannot be used with the newer laptops which have windows 7. Brother RLB6770 FS 67/98 Stitch Sewing 4x4" Embroidery Machine - Factory Serviced, 5 Extras!